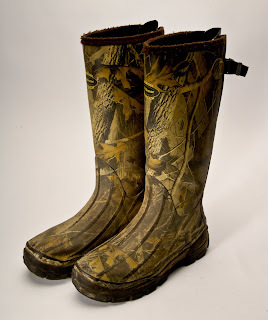 Nothing in my hunting closet sees more use than my hunting boots. Not my knives, by bow, my rifles, my camo clothing, nothing... Unlike most pieces of gear, my hunting boots get used year-round during the various hunting seasons and for any off-season scouting. Add in the important roll a pair of boots plays in providing good foot support, traction, protection - and most important - comfort, and I believe you can make a strong case that there is no more important piece of hunting gear than a good pair of hunting boots. My boots of choice... the LaCrosse Alpha Burly Sport Hunting Boots. Take a look at the following video review to see why. do the uninsulated boots keep your feet warm down to below 30 degrees with the right socks? would you recommend a size larger to permit layering socks? I've worn mine down into the low teens with just a single pair of thick wool socks and stayed pretty comfortable for several hours of sitting in my treestand. In the lown thirtys, they are all you need for stand hunting. For my purposes, I get them to fit well with a single pair of thick socks. That way, my feet don't slide around in them in warmer weather when I'm wearing just a pair of lighter cotton socks. On sale now @ Gander Mountain for $103.99. I can't decide between these and another pair of LaCrosse boots that I tried on in the store. Thanks for your review.